Braking on the Mankame EP-1 is enforced by Dual 320 mm front and 245 mm rear disk brakes equipped with machine learning based dual-channel ABS. Gone will be the days where you burn litres of petrol when taking your superbike for a spin. A Bengaluru-based startup called Mankame is promising to bring an electric super-bike that can go up to 500 kms on a single charge and touch a top speed of 251 kmph. The startup, Mankame Automotive, is building the motorcycle called as Mankame EP-1, which will be a crowdfunded project. According to a report on CarAndBike, the EP-1 comes with an 18.4 kWh ,liquid-cooled battery pack which can provide a run time of 480 km on highways at a speed of 70 kmph, and 500-550 km range in the city. The high-density battery contains Samsung cells and a Matrix BMS system, which "helps in optimising safety and efficiency", says the report. According to the report, the motorcycle comes with 40 KW high performance PMSM Motor which produces 180 Nm at the shaft and 432 Nm at the wheel. Braking on the Mankame EP-1 is enforced by dual 320 mm front and 245 mm rear disk brakes equipped with a "machine-learning-based dual-channel ABS". 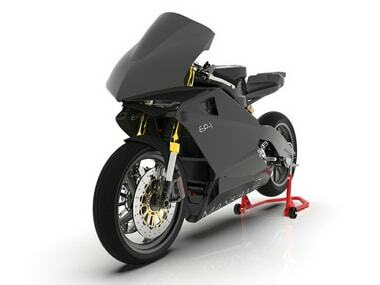 The bike is light (160 kg) as compared to combustion-engine powered bikes that offer similar performance. Another report on Business Today mentions that the crowdfunding program will start from 1 July and that the startup is planning to deliver the electric bike in 2022. There's no word on expected pricing yet. Ealrier, another Bengaluru-based startup called Emflux showcased an electric bike at the Auto Expo 2018. The bike is priced at Rs 6 lakh and is able to gain a top speed of 200 kmph. Emflux Model 1 produces 84 Nm of torque at 8,400 rpm and a peak power of 60 kW with a 9.7 KWh battery.